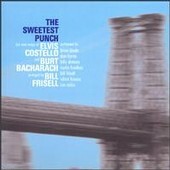 I originally bought the companion album to this CD, Elvis Costello and Burt Bacharach's Painted From Memory, thinking that Frisell had been the arranger on that album. I was wrong it turned out Frisell was arranging the same songs for this mostly instrumental album, to be released several months later. I initially wrote it off Painted From Memory as schmaltzy and overly sentimental song writing. However, after a little bit more listening, I become intoxicated by Bacharach's lilting melodies that never quite go where you expect, but somehow always sound just right. The lyrics were gorgeous as well, and songs like "I Still Have That Other Girl" and "Painted From Memory" are some of the eloquent songs about love and loss I've ever heard. Suddenly I was really excited to hear Frisell's take on this; I am not dissapointed. It is fascinating to see how different his take on these songs is from Bacharach and Costello. Some of the weaker songs from Painted achieve new lives here, and some of the strongest like "Darkest Place" do not seem as effective instrumentally. However, the personell on this album is stellar. Although there are only seven musicians on this album, it sounds like a full big band. The rhythm section consists of Frisell, the low key but strong Viktor Krauss, and the energetic Brian Blade on drums, who is probably best know for his work with Joshua Redman. The horns are the eclectic jazz clarinetist Don Byron, Billy Drewes, and Quartet alums Ron Miles and Curtis Fowlkes. The soloing is kept at a minimum here, with the emphasis being placed on the group colors. The opening track shows an amazingly sophisticated arranging, with the horns at times achieving a broad growl that completely envelopes the listener in sound. This is the side of Frisell that was hinted at in Quartet, but comes out full bloom here. The sound of this album is decidedly soft, and while quietly beautiful, it is a far cry from the frenetic rock of Live, or even the eerie Americana of Quartet. This may deter fans who prefer Frisell's earlier and more noisy work. Aside from the rock solo on "Such Unlikely Lovers" there is barely a hint of distortion anywhere on this album. This more than anything else of the past few years shows just how far Frisell has come from Naked City and Live.